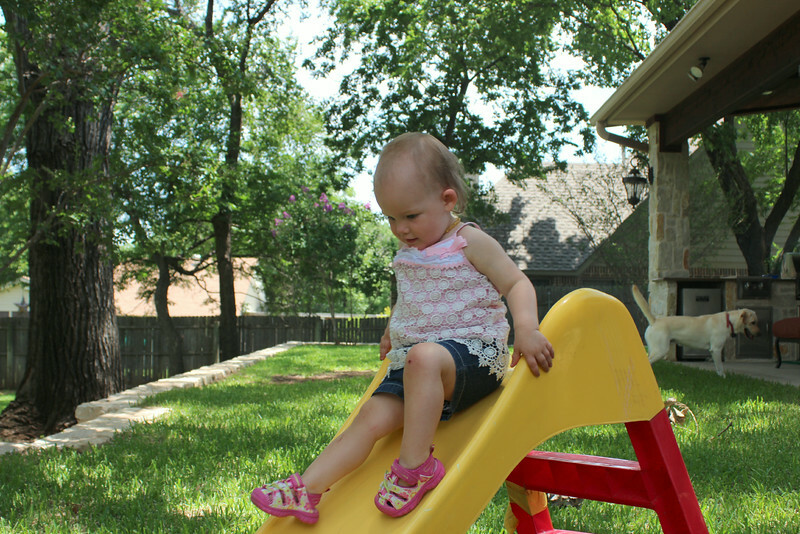 Ask the Mamas: Summer Activities Mama Say What?! | Mama Say What?! Swimming or anything with water. Seriously, if N could live in the water, he would. By summer it’s usually too hot around here to be outside during the day for any real length of time (average temps are in the 100′s). So if we aren’t doing something water related, then we watch movies, plan play dates with friends, go to the beach, etc. For when we are home and he needs to get outside, we have a water table on our patio and a basketball hoop. This year we are planning a camping trip. I am super excited for that. We also now have a few inflatable jumper places and a splash pad is opening this month. So hopefully our summer will be even more fun this year. ~Cari H.
I’m hoping we get to play outside more this summer than last. Last year, we didn’t have a fenced in yard, my toddler had mono and I had a three month old on my hip. This summer, we are fenced in, healthy and we have a new swingset! Both of my boys also love taking walks, going to playgrounds and playing with the water table. 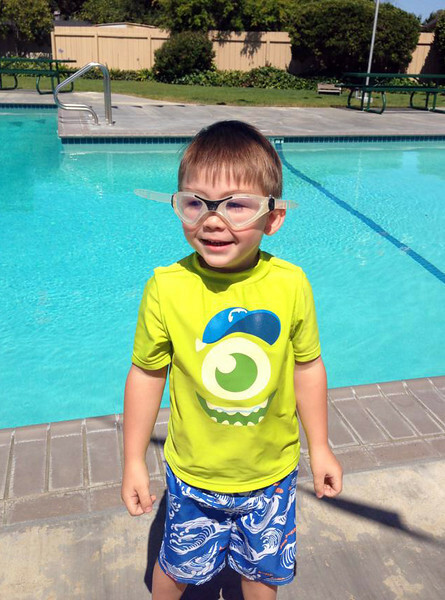 My little guy especially loves to dump the water into his lap.~Mary Ellen M.
My kids LOVE being outside! I got a little kiddie pool last summer that my oldest loved to play in. His water activity table kept him entertained for at least half an hour! His favorite thing, though, would definitely be swinging on the swing set or walking to the park! He also just got golf clubs for his birthday so I am sure he will be swinging those for hours in the backyard! We live on a lake so I can’t wait for them to be old enough where we can go take a boat ride or kayak or enjoy something fun on the lake! ~Heidi C.
We love to play outside as often as we can when the weather is nice. My son helps me with our vegetable garden and loves to dig in the dirt with his construction toys. We love to make a picnic lunch and walk or drive to any number of playgrounds or a farmer’s market when they are open. When it’s not too hot or if we can get out the door in the morning, we love to go hiking. We have some wonderful hiking trails close to us living so close to the mountains. I’ll bring a baby carrier with me in case my son gets to a point where he doesn’t want to walk and it turns into quite a workout for me. When it’s really hot (pretty much all of July & August) we will put some water in an inflatable kiddie pool and my son happily splashes around. I will just sit on the side with my feet in the water and my Kindle while he plays. When it’s too hot to play outside (it happens! ), we will hit up one of the indoor playgrounds local to us or go to our local library. They try to have fun activities scheduled a few days each week during the summer. ~Alex T.
Definitely swimming and going to the beach. We tend to have horribly long winters here, so when the hot weather comes it’s nice to be out by the water and enjoying it! ~Kathy S.
Anything water-related is a big hit at our house! 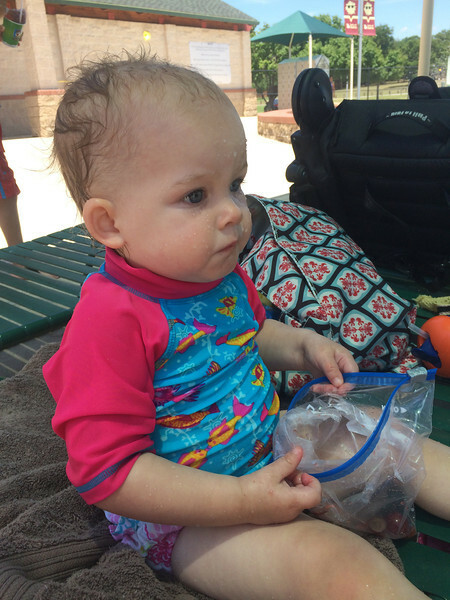 Pool, splash-pad, kiddie pool, sprinkler…you name it, my daughter loves it! Aside from that, we like going to the park early in the morning when it’s still cool out, eating dinner outside, going to the zoo on hot but cloudy days, and when it’s just too hot, checking out the aquariums and museums in the metro-plex. ~Michelle W.
My daughter loves playing in her kiddie pool on a hot day. She and my husband are also big fans of homemade popsicles. And we all love taking our pop-up tent to the park or the beach for a picnic. Here in Japan, one of the most popular picnic foods is “onigiri,” or rice balls. I asked a friend to teach me how to make them so I can take them on our picnics this summer! 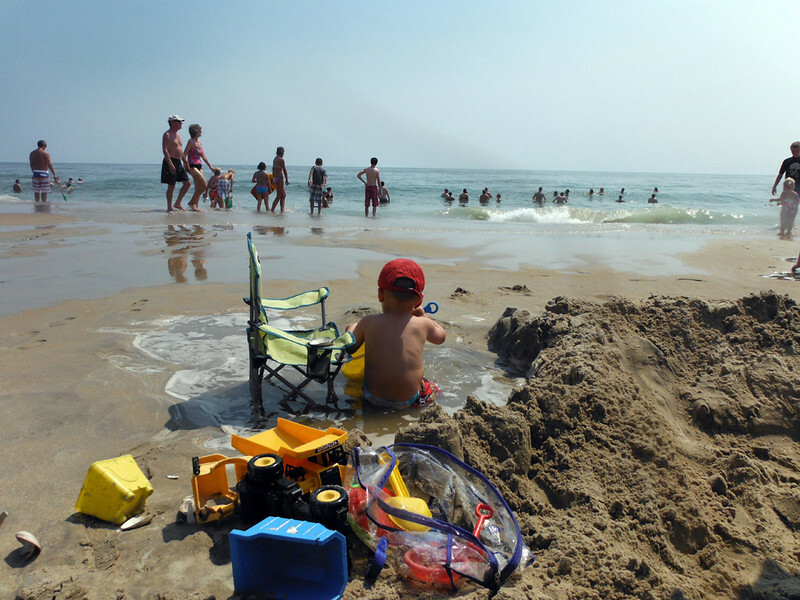 ~Christina D.
What do you and your kids love to do in the summer? Added by Michelle W. on June 17, 2014.